The problem of corporate influence in politics and government is heating up in BC as we head towards the May election. 2017 kicked off with an explosive story in the New York Times, aptly titled “British Columbia: The Wild West of Canadian Political Cash.” The story drew widespread attention to the complete absence of limits in BC on political donations by wealthy corporations and individuals, including foreign donations and contributions from outside the province. The international spotlight highlighted a problem of central concern to us at the Corporate Mapping Project (a major research initiative led by the University of Victoria, the CCPA and the Parkland Institute). In our latest study, we took a close look at political donations by the fossil fuel industry specifically. We also analyzed data from the BC Lobbyist Registry to find out what kind of access to government these donations help secure. The results are, quite simply, jaw-dropping. And they raise important questions about how we want our democracy to function. We tallied up all political donations by fossil fuel companies and industry organizations to the BC Liberal Party and the New Democratic Party of BC (the two leading parties) between 2008 and 2015. This time period covers the last two election cycles and corresponds to the steady increase in natural gas production, which ramped up starting in 2008–09. Over this eight-year period, 48 fossil fuel companies and industry groups donated a whopping $5.2 million. This accounts for just under 10 per cent of all donations from corporations and business associations, and is just over half the total donated by real estate firms (the largest sectoral contributors). As Table 1 shows, the top 10 donors contributed more than three-quarters of the $5.2 million fossil fuel industry total. Among these top donors there is a distinct geography of giving, with firms mostly headquartered in Calgary. Only two of the companies are headquartered in BC. One company — Spectra — is headquartered outside of Canada. And Chevron Canada and Imperial Oil are foreign-controlled subsidiaries of US-based parent companies. Five of the top donors—Encana, Canadian Natural Resources Ltd, Enbridge, Imperial Oil and Teck Resources—rank among the ten most profitable Canadian fossil fuel corporations. We also found substantial donations from oil and pipeline companies with only limited operations in BC, but whose ‘adjacent interests’ (i.e the desire for oil from Alberta tar sands to reach BC “tidewater”) are presumed to motivate giving. Notable contributions over this period (largely directed to the BC Liberals) came from Cenovus ($85,425) and MEG Energy ($65,510). Texas-based Kinder Morgan gave $20,000 and Suncor $60,420. 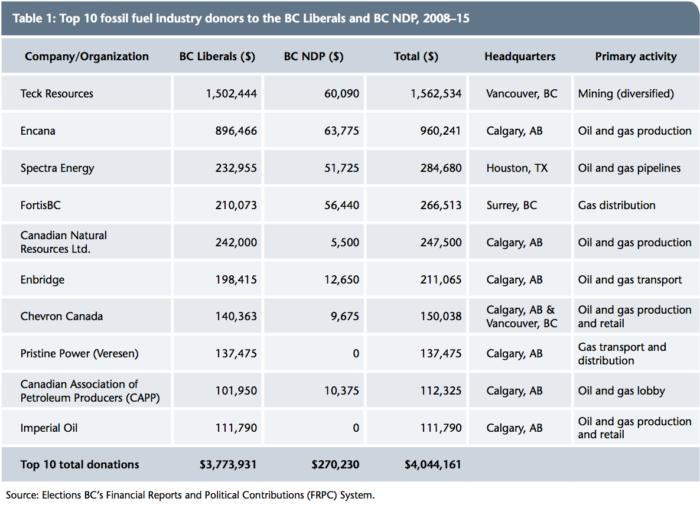 Of the $5.2 million total donated by the fossil fuel industry—92 per cent or $4.8 million—went to the BC Liberals. Donations to the BC NDP increased in 2012 and 2013, with the party receiving 13 per cent and 22 per cent of the total share in those respective years as corporations hedged their bets in advance of the 2013 election. Donations to the BC Liberals spiked significantly in 2013 as well. In addition to a provincial election, this increase coincided with a major push by the government to develop an LNG export industry. Political donations from the natural gas sector doubled in 2012-13 compared to 2008-09, which parallels increasing rates of natural gas production and the introduction of regulations and subsidies designed to support unconventional gas development in the province’s Northeast. In 2014 and 2015, newly formed LNG operators made significant donations—Pacific Northwest LNG, Steelhead LNG, Prince Rupert Gas Transmission, and Woodfibre LNG contributed $110, 650 to the Liberals and $15,500 to the NDP. But political donations are only part of the story. These contributions dovetail with trends in lobbying and access to key political decision makers. And on this score the numbers are equally alarming. We conducted an exhaustive search of the Lobbyist Registry and found 43 fossil fuel corporations and industry groups with registered lobbying efforts between 2010 and October 2016. The top 10 most active corporations and groups were responsible for the majority of lobbying by the fossil fuel sector. These top 10 reported a combined total of 19,517 lobbying contacts with public office holders over the six-year period (see Table 2). That’s an average of 14 lobbying contacts per business day. Not surprisingly, there is substantial overlap between political donations and lobbying, with seven of the top ten political donors also ranking among the top ten most-active lobbyists. The high volume and frequency of lobbying reveal the pressure these corporations are able to put on public officials in a sustained effort to influence government policy. We also took a close look at who the most targeted officials and agencies are. Twenty-eight per cent of lobbying contacts by the top 10 were with cabinet ministers—an unrivalled opportunity to shape public policy. Rich Coleman, Minister of Natural Gas Development, is the most-targeted minister with 733 contacts by the top 10 firms. This amounts to an average of three contacts per week for Coleman alone over the six-year period. Encana and Spectra did the most lobbying of Minister Coleman—not surprisingly given they are major player in natural gas. The next most contacted is Premier Christy Clark (618 contacts), with Chevron Canada leading the way. Minister of Energy and Mines Bill Bennett (437 contacts), Environment Minister Mary Polak (354) and Finance Minister Mike de Jong (330) were also among the most heavily targeted members of cabinet. Almost half (48 per cent) of lobbying contacts were with ministerial staff (such as deputy ministers). 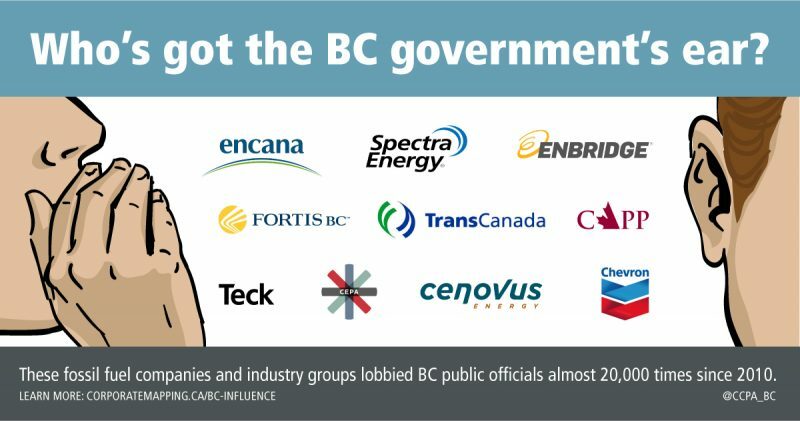 The Ministry of Energy and Mines was the most heavily targeted (1,353 contacts) with FortisBC, Encana and the Canadian Association of Petroleum Producers (CAPP) targeting it most heavily. Next up, the Ministry of Natural Gas Development (1,045 contacts), with CAPP coming on especially strong. The Ministry of Environment — whose mandate ought to be less captured by industry than the so-called “dirt ministries” —was the third-most contacted (1,026). The Oil and Gas Commission (984), Office of the Premier (864), Ministry of Aboriginal Relations and Reconciliation (658) and Ministry of Finance (637) were also heavily lobbied. The remaining 24 per cent of contacts were with MLAs. Spectra Energy and Teck Resources are particularly active—unlike others in the top 10, the majority of their total lobbying contacts are with MLAs. This focus on MLAs may reflect the nature of their business operations, which are spread across large areas of the province. Both NDP and Liberal MLAs are heavily targeted. This is especially the case with the past and current leaders of the BC NDP, Adrian Dix and John Horgan, who are among the top three most contacted. The strategic targeting of these leaders of the official opposition is consistent with the “hedging” approach seen with the spike in political donations in to the NDP 2012 and 2013. (Indeed, most of the reported contacts with Adrian Dix occurred during that two-year period). The range of topics reported by the top 10 shows they seek to influence policy related to issues such as royalty rates from fossil fuel extraction, land access, corporate taxation, consultation processes with First Nations, greenhouse gas emissions, and LNG development, among others. We also found lobbying efforts aimed at influencing broad policy frameworks. Indeed, from October 2015 to August 2016, CAPP alone reported 201 lobbying contacts with government in relation to the BC Climate Leadership Plan (which turned out not to be much of a plan at all). 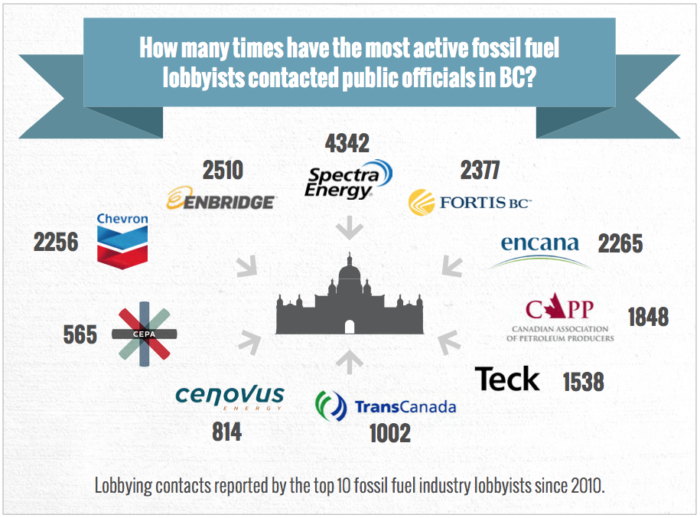 Other active lobbyists beyond the top 10 include Talisman Energy (at 515 contacts), Kinder Morgan Canada (462), Canadian Natural Resources Ltd (399), Shell Canada (298), Imperial Oil (282), Penn West Petroleum (252), Husky Energy (215), Suncor (148), and Altagas (106). A number of newly-formed LNG operators and industry advocacy groups are also highly active, such as Pacific Northwest LNG (with 417 contacts), the BC LNG Alliance (101), LNG Canada Development (89), Woodside Energy (74), Petronas (42), and Steelhead LNG (16). The amount of lobbying by environmental organizations—among those most likely to oppose increased fossil fuel development—pales in comparison. There are only eight such organizations with active lobbying efforts, reporting a total of 1,324 contacts over the same six-year period. These findings paint a deeply troubling picture of the state of democracy in BC. Everyday citizens, First Nations and public interest organizations can only dream about the kind of access powerful fossil fuel corporations and industry groups enjoy thanks to their deep pockets. And the degree to which political contributions are coming from outside BC is alarming, and not something many other democracies allow. In a province where the government has pursued fossil fuel development with remarkable single-mindedness, and at a time when the climate crisis requires urgent action, reforms are clearly needed. Whoever wins the provincial election this May, a first order of business should be to ban political donations by anyone other than individuals whose primary residence is in BC, cap individual contributions at a modest level that prevents wealthy donors from having undue influence, and substantially tighten the province’s Lobbyist Registration Act. Nicolas Graham is a student researcher with the Corporate Mapping Project, and a PhD candidate in Sociology at the University of Victoria. Shannon Daub is Associate Director of the CCPA’s BC Office. She co-directs the Corporate Mapping Project with Bill Carroll, a Professor of Sociology at the University of Victoria, which hosts the project. Find out more at corporatemapping.ca. This research was supported by the Social Science and Humanities Research Council of Canada (SSHRC).